IBA has produced about 13,000 graduates to-date, each one being an outstanding professional. Most of the Chief Executives and top management positions in leading listed companies, corporations and banks are held by the alumni of IBA. The IBA graduates have worked and matched in performance with the graduates of the most renowned business schools of the world and is the school of choice for most of the young men and women interested in careers and leadership in business. 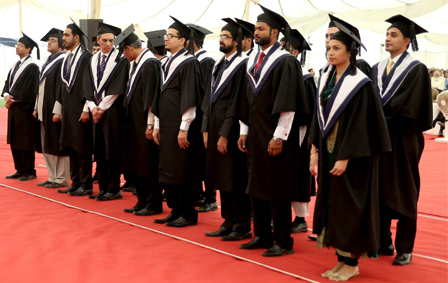 A large number of IBA graduates are working outside Pakistan in the Middle East, Saudi Arabia, United Kingdom, Canada, Singapore and the United States. Currently, amongst the top leading banks in Pakistan, IBA graduates take the lion's share in managing these esteemed organizations. Moreover, amongst the top MNCs and FMCGs, alumni of IBA are holding the top most position. Amongst its prominent alumni are His Excellency Mamnoon Hussain, the President of the Islamic Republic of Pakistan, and Mr. Shaukat Aziz, a former Prime Minister of Pakistan.